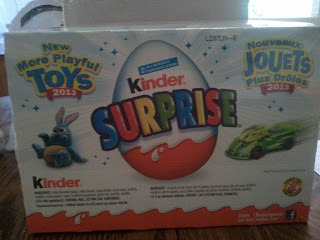 I'm Freckles.... the Mom: Kinder Surprise....SURPRISE! So this is what came in the mail. Well, rather than tell you, let me show you? 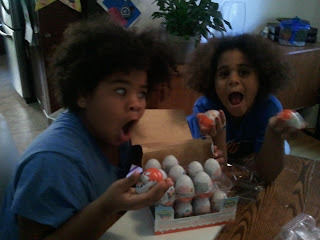 So now they are not the only ones excited about the Kinder Surprise. My hubby also go in on the party. Sadly there are no pictures of him though. I wish there was because I he tells me he added a little something special to his chocolate egg. Now I need to try that! What do you add to your Kinder Egg?